For the past two years the City of Savannah and local Savannah retailers have come together to produce an evening of shopping and entertainment with the goal of helping the local economy maintain its strength and community while showcasing the best that our city has to offer in fashion, music, art and design. The event will once again take place for the 2013 year with the newly renamed Savannah’s Fashion Night. The event is set to take place September 5th from 6:30p.m. to 11:00p.m. on Broughton Street in historic downtown Savannah. The 2012 event saw over 5,000 attendees to Savannah’s downtown area shopping at over 30 approved retailers that also created special events and sales for the evening. Vendors saw the true meaning of a community collaborative effort to celebrate fashion, restore consumer confidence & boost local economy. In the past two years the event has received continued support of local and regional sponsors including Vaden VW and Chevrolet Cadillac, The Creative Coast, Cecilia Russo Marketing, Downtown Business Association, Our Skinny Health, Rise Model Management, Halo Models, Judge Realty, Savannah Magazine, South Magazine, The Telfair Museums & more. “With the additions of Southern Motors, Savannah Arts Academy and Dollhouse Productions as sponsors, the evening stands to be the entertainment event of the year. This year’s event will once again see an evening of a pedestrian friendly Broughton Street where shoppers, retailers, entertainer and artists will come together for an evening fun. 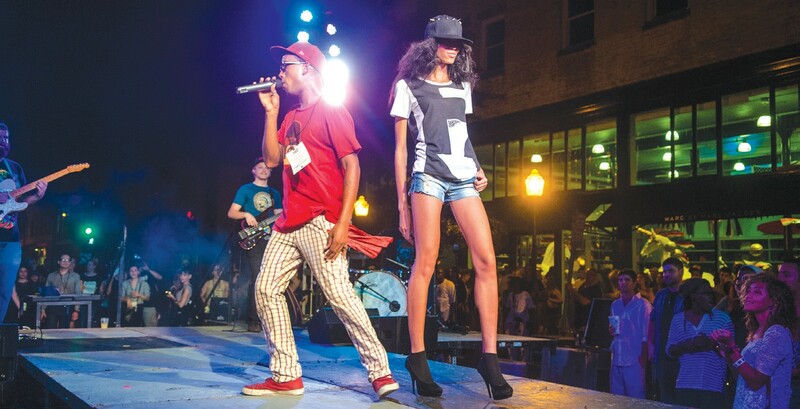 Two stages on either side of Broughton Street will showcase fashion shows of local retailers and designers strutting to the music of local bands and DJ’s. On Thursday afternoon, the north/south streets along Broughton Street between Montgomery and Drayton Streets will close at 3:00pm and Jefferson, Bull and Barnard Streets will close at 5:30pm. For the entire evening, Bryan, Whitaker, Robinson and State garages will be offering $2 parking and free parking will be available at the Civic Center.